Human beings experience sound in all directions—like when a fire truck zooms by, or when an airplane is overhead. 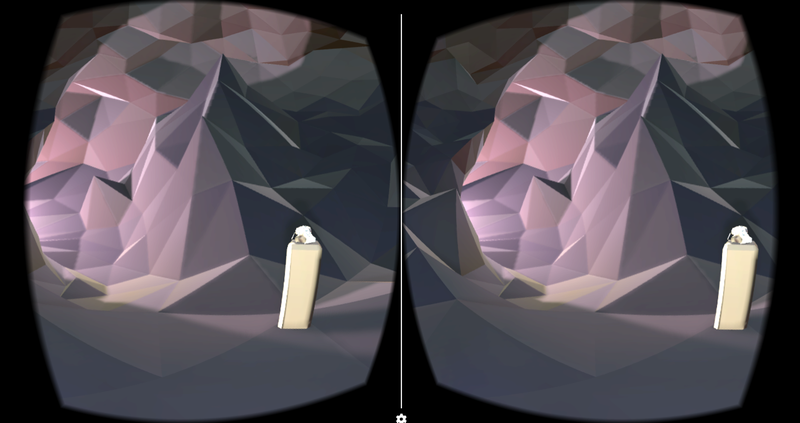 Starting today, the Cardboard SDKs for Unity and Android support spatial audio, so you can create equally immersive audio experiences in your virtual reality (VR) apps. All your users need is their smartphone, a regular pair of headphones, and a Google Cardboard viewer. The SDK combines the physiology of a listener’s head with the positions of virtual sound sources to determine what users hear. For example: sounds that come from the right will reach a user’s left ear with a slight delay, and with fewer high frequency elements (which are normally dampened by the skull). The SDK lets you specify the size and material of your virtual environment, both of which contribute to the quality of a given sound. So you can make a conversation in a tight spaceship sound very different than one in a large, underground (and still virtual) cave. The SDK is optimized for mobile CPUs (e.g. SIMD instructions) and actually computes the audio in real-time on a separate thread, so most of the processing takes place outside of the primary CPU. The SDK allows you to control the fidelity of each sound. As a result, you can allocate more processing power to critical sounds, while de-emphasizing others. It’s really easy to get started with the SDK’s new audio features. Unity developers will find a comprehensive set of components for creating soundscapes on Android, iOS, Windows and OS X. And native Android developers will now have a simple Java API for simulating virtual sounds and environments. Check out our Android sample app (for developer reference only), browse the documentation on the Cardboard developers site, and start experimenting with spatial audio today. We’re excited to see (and hear) the new experiences you’ll create! Google Play services 8.1: Get ready for Marshmallow! With the rollout of Google Play services 8.1 finally finished, there’s a lot of new information to share with developers about the release! Android 6.0 (Marshmallow) has introduced a new permissions model allowing users to control app permissions at runtime. As an app developer, it’s important for you to adopt this and give your users good control over the permissions your app needs. You can find more details here. If your app is using Google Play services SDK versions prior to 8.1, you must update to use this new version to ensure your app is fully compatible with Android 6.0. This will enable you to manage the permission flows appropriately for your app and avoid any potential connection issues. For more details, and a step-by-step guide to what your app should do for the best user experience, take a look at this blog post on the Android Developers site. App Invites allows you to grow your apps audience by letting existing Android and iOS users invite their Google contacts via email or SMS to try your app out. 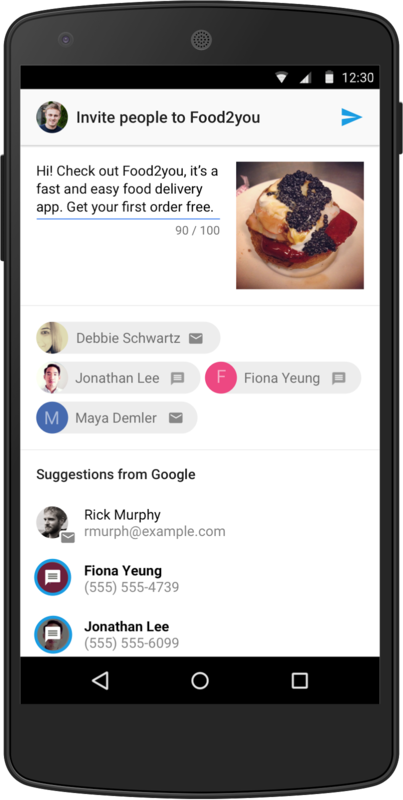 Google Play services 8.1 adds the ability for developers to customize the email invitation, including adding a custom image, and specifying a call-to-action button text. These improvements should help developers increase user engagement and conversions with app invites. Android Wear provides a feature called ambient mode, enabling apps to stay visible, even when they aren’t actively being used. Now, with Google Play services 8.1, the Google Maps Android API supports ambient mode. In this mode, a simplified low-color rendering of the map will be seen. This reduces power consumption by lighting fewer pixels, but the camera and zoom level are retained, so user context will be kept. To learn more about ambient mode, check out this blog post. Google Nearby allows you to build simple interactions between nearby devices. A new addition in Google Play services allows your app to receive callbacks when an active Nearby publish or subscribe expires. This frees you from tracking the TTL and allows your app's UI to accurately reflect whether Nearby is active or not. The new Play Games Player Stats API allows you to build better, smarter, games. It will let you tailor user experiences to specific segments of players and different stages of the player lifecycle. For example, you can give your most valuable players that are returning from a break in play a special welcome back message and reward. In this release, there are some changes to GoogleApiClient and PendingResult, making them abstract classes, which may lead to breaking changes in your code. Learn more about these changes and how to handle them in the release notes. You can get started developing today by downloading the Google Play services SDK from the Android SDK Manager. To learn more about Google Play services and the APIs available to you through it, visit our documentation on Google Developers. ADT 11 focuses on editor improvements. First, it offers several new visual refactoring operations, such as “Extract Include” and “Extract Style,” which help automatically extract duplicated layout fragments and style attributes into reusable layouts, styles, and themes. ADT 11 packs a long list of new features and enhancements. Please visit our ADT page for more details. For an in-depth demo, check out the video of our Android Development Tools session at Google I/O, below. Please note that the visual layout editor depends on a layout rendering library that ships with each version of the platform component in the SDK. We are currently working on a number of improvements to this library as well, which we plan to release soon for all platform versions. When we release the updates, some new features in ADT 11 will be “unlocked” - such as support for ListView previewing - so keep an eye on this blog for further announcements. 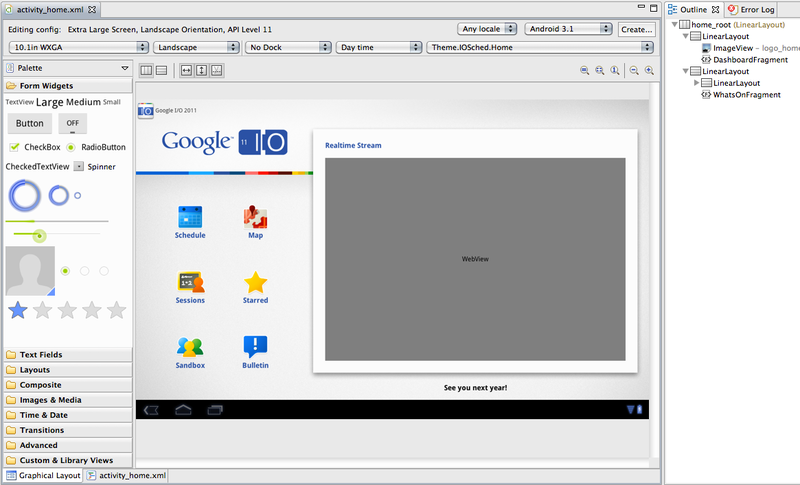 At the Google I/O conference a month ago, we demonstrated the next version of the Android Development Tools (ADT) plugin. Today we’re happy to announce that version 11 is done and available for download! , which introduced several new forms of communication for developers and users. One of those, Near Field Communications (NFC), let developers get started creating a new class of contactless, proximity-based applications for users. A comprehensive NFC reader/writer API that lets apps read and write to almost any standard NFC tag in use today. Advanced Intent dispatching that gives apps more control over how/when they are launched when an NFC tag comes into range. Some limited support for peer-to-peer connection with other NFC devices. We hope you’ll find these new capabilities useful and we’re looking forward to seeing the innovative apps that you will create using them. Android 2.3.3 is a small feature release that includes a new API level, 10. Going forward, we expect most devices shipping with an Android 2.3 platform to run Android 2.3.3 (or later). For an overview of the API changes, see the Android 2.3.3 Version Notes. 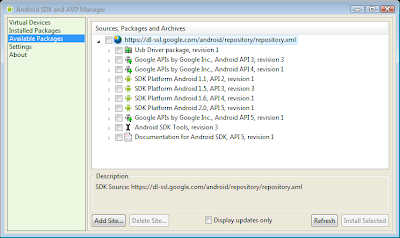 The Android 2.3.3 SDK platform for development and testing is available through the Android SDK Manager. Several weeks ago we released Android 2.3, which introduced several new forms of communication for developers and users. One of those, Near Field Communications (NFC), let developers get started creating a new class of contactless, proximity-based applications for users. Enhancements for game development: To improve overall responsiveness, we’ve added a new concurrent garbage collector and optimized the platform’s overall event handling. We’ve also given developers native access to more parts of the system by exposing a broad set of native APIs. From native code, applications can now access input and sensor events, EGL/OpenGL ES, OpenSL ES, and assets, as well a new framework for managing lifecycle and windows. For precise motion processing, developers can use several new sensor types, including gyroscope. Rich multimedia: To provide a great multimedia environment for games and other applications, we’ve added support for the new video formats VP8 and WebM, as well as support for AAC and AMR-wideband encoding. The platform also provides new audio effects such as reverb, equalization, headphone virtualization, and bass boost. New forms of communication: The platform now includes support for front-facing camera, SIP/VOIP, and Near Field Communications (NFC), to let developers include new capabilities in their applications. For a complete overview of what’s new in the platform, see the Android 2.3 Platform Highlights. Simplified debug builds: Developers can easily generate debug packages without having to manually configure the application’s manifest, making workflow more efficient. Integrated ProGuard support: ProGuard is now packaged with the SDK Tools. Developers can now obfuscate their code as an integrated part of a release build. HierarchyViewer improvements: The HierarchyViewer tool includes an updated UI and is now accessible directly from the ADT Plugin. Preview of new UI Builder: An early release of a new visual layout editor lets developers create layouts in ADT by dragging and dropping UI elements from contextual menus. It’s a work in progress and we intend to iterate quickly on it. To get started developing or testing applications on Android 2.3, visit the Android Developers site for information about the Android 2.3 platform, the SDK Tools, the ADT Plugin and the new NDK. Check out the video below to learn more about the new developer features in Android 2.3.
, the source code for Android 2.2, which we call Froyo, has been released. 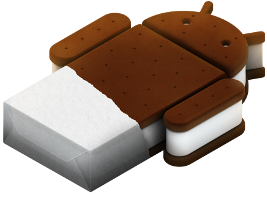 The Android 2.2 SDK that was released at Google I/O contained a preview of the Froyo system image and today, we are releasing an update to bring it into sync with the system image pushed to Nexus One devices. I encourage all developers to use the SDK manager to update to this version. 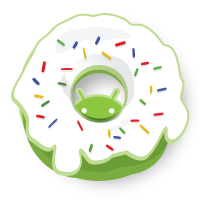 As you may have noticed, the source code for Android 2.2, which we call Froyo, has been released.
. Android 1.6, which is based on the donut branch from the Android Open Source Project, introduces a number of new features and technologies. With support for CDMA and additional screen sizes, your apps can be deployed on even more mobile networks and devices. You will have access to new technologies, including framework-level support for additional screen resolutions, like QVGA and WVGA, new telephony APIs to support CDMA, gesture APIs, a text-to-speech engine, and the ability to integrate with Quick Search Box. What's new in Android 1.6 provides a more complete overview of this platform update. The Android 1.6 SDK requires a new version of Android Development Tools (ADT). The SDK also includes a new tool that enables you to download updates and additional components, such as new add-ons or platforms. You can expect to see devices running Android 1.6 as early as October. As with previous platform updates, applications written for older versions of Android will continue to run on devices with Android 1.6. Please test your existing apps on the Android 1.6 SDK to make sure they run as expected. Over the next several weeks, we will publish a series of blog posts to help you get ready for the new developer technologies in Android 1.6. The following topics, and more, will be covered: how to adapt your applications to support different screen sizes, integrating with Quick Search Box, building gestures into your apps, and using the text-to-speech engine. If you are interested to see some highlights of Android 1.6, check out the video below. I am happy to let you know that Android 1.6 SDK is available for download. Android 1.6, which is based on the donut branch from the Android Open Source Project, introduces a number of new features and technologies. With support for CDMA and additional screen sizes, your apps can be deployed on even more mobile networks and devices. You will have access to new technologies, including framework-level support for additional screen resolutions, like QVGA and WVGA, new telephony APIs to support CDMA, gesture APIs, a text-to-speech engine, and the ability to integrate with Quick Search Box. What's new in Android 1.6 provides a more complete overview of this platform update. I'd also like to note that Android developer phones like the ADP1 are intended for application development, rather than daily use. Additionally, they are operator-neutral and country-neutral, so they may not include certain features found on end-user devices. I've got some good news today: the Android 1.5 SDK, release 1 is ready! Grab it from the download page. For an overview of the new Android 1.5 features, see the 1.5 release notes page in our developer site. I am also happy to let you know that our partners at HTC have made available new system images to upgrade your Android Dev Phone 1 (ADP1) to Android 1.5. This new version (which is only available for the ADP1) is based on the Cupcake branch from the Android Open Source Project and corresponds to the system image of the Android 1.5 SDK, release 1. If you have questions about the process of updating your device, you can ask the mailing list that we've set up. We've also made changes to the developer tools and the structure of the SDK itself. 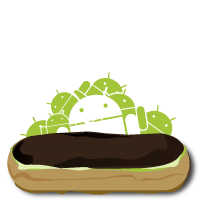 Future Android SDK releases will include multiple versions of the Android platform. 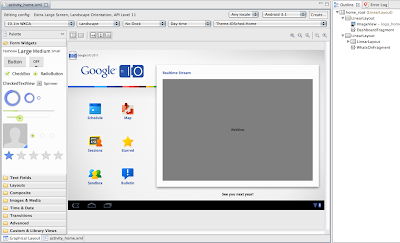 For example, this early-look includes Android platform versions 1.1 and 1.5. One benefit of this change is that developers can target different Android platform versions from within a single SDK installation. Another is that it enables developers to install Android SDK add-ons to access extended functionality that might be provided by OEMs, carriers, or other providers. We at Google are using this feature ourselves: this early-look SDK includes an add-on for the Google APIs. This add-on provides support for the Google Maps API, which was previously embedded in the "core" SDK. 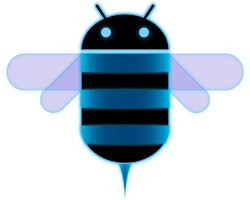 To help you prepare your applications for the release of Android 1.5 on phones, over the next few weeks we'll be publishing a series of articles on this blog to highlight new APIs and other changes. In addition to the new APIs that I've mentioned, we'll cover topics such as OpenGL, asynchronous tasks, system settings, and new Activity callbacks. I encourage you to start working with this early-look SDK, but please know that the APIs for Android 1.5 have not been finalized. The majority of the APIs are settled, but there may be some changes before the final release. As a result, it's very important that you don't release applications based on this early-look SDK, since they may not work on real devices. The applications you release should be built on the final Android 1.5 SDK release, which will be available around the end of this month. I look forward to seeing all the great apps that use the new capabilities in Android 1.5. Happy coding! I'm excited to announce that starting today, developers can get an early look at the SDK for the next version of the Android platform. 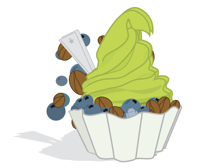 This new version (which will be 1.5) is based on the cupcake branch from the Android Open Source Project. Version 1.5 introduces APIs for features such as soft keyboards, home screen widgets, live folders, and speech recognition. At the developer site, you can download the early-look Android 1.5 SDK, read important information about upgrading your Eclipse plugin and existing projects, and learn about what's new and improved in Android 1.5.
, you'll need an updated SDK. That's why I'm pleased to let you know that the Android 1.1 SDK, release 1 is now available. As you'll quickly see from the release notes, the actual API changes are quite minor, but useful. This new SDK has all the new APIs, as well as a new emulator image to let you test your applications. If you have a retail device running Android, contact your operator for the update schedule. An updated v1.1 system image for the Android Developer Phone 1 will be coming soon. In addition to the new APIs, the emulator also contains improved ability to test localizations to the German language. Localizations for other languages will be added in future SDK releases. You can download the updated SDK using the links above. Happy coding! Hello, developers! As you may have heard by now, users around the world have started to receive updates to their Android devices that provide new features and functionality. You may also have noticed that the new update reports as "Android 1.1". Applications written with the 1.0_r1 and 1.0_r2 SDKs will continue to work just fine on Android 1.1. But if you want to take advantage of the new APIs in 1.1, you'll need an updated SDK.